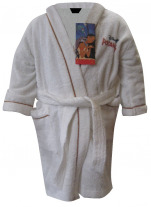 Children's bathrobe There are 12 products. 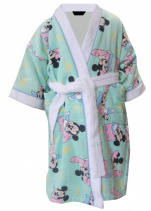 Hooded bathrobe for 4 years old child. 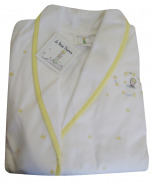 Bathrobe in 100% cotton terry meringue (off-white) with hood in 100% cotton terry inner and 100% cotton percale fabric with small flowers. 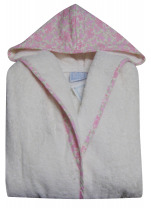 Contour sleeve and bathrobe with small pink flowers with green leaves. 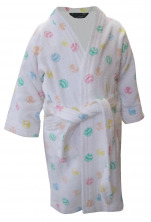 Bathrobe with hood vanilla cream background for children of +/- 8 years. 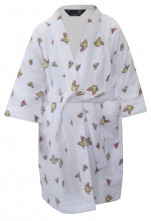 Bathrobe with print little brown bears dressed in green and burgundy surrounded by gifts and green pastilles in 93% cotton and 7% polyamide. 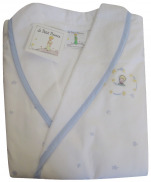 Bathrobe with 2 side pockets, 1 pendant, 2 loops for the belt, made in the same teddy fabric. 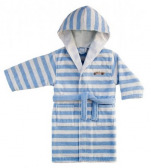 Children's Bathrobe with hood 100% cotton, velvet jacquard towelling, striped, 360 gr/m². 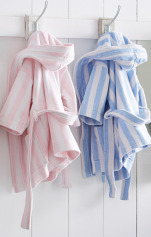 This bathrobe is declined in 2 colors: pink and blue. 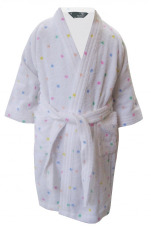 Bathrobe available in size 0-2 years, 4-6 years, 8-10 years and 12-14 years.